Get ready for the next level of employer branding: the Team Value Proposition (TVP)! Today’s candidates want to dig deeper beyond corporate messaging to learn about the specific team they might be working with. 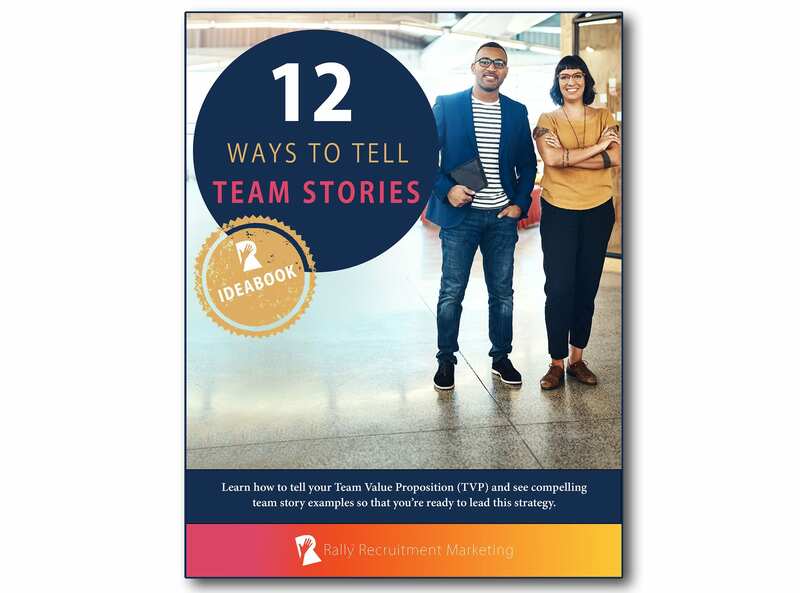 In this Rally Ideabook, you’ll see 12 ways to create compelling team stories that tell your TVP. We share insights from 3 leading employers along with examples of team stories they created to solve a hiring challenge. The stories give candidates what they want: The inside scoop on the employee experience, team culture and projects they could contribute to. Featuring social content and video examples from AstraZeneca, BAE Systems and CVS Health. Telling team stories is all about showcasing the authentic perspectives and delivering the inside scoop on what it’s like to work in a team, including the employee experience, culture, people and the projects. Demonstrating the value of working for your company is a key part of your Recruitment Marketing strategy. Over the past several years, you’ve probably invested a lot of time into developing your company’s Employer Value Proposition (EVP)—answering why candidates should want to work for your organization, and what your company can do for them, both personally and professionally. Just when you thought you were all set by having your EVP pillars defined and your key content pieces created, there’s more to do! Today’s candidates want to dig deeper beyond corporate messaging to learn what it’s like to work as part of the specific teams within your company. Get ready for the next level of employer branding: the Team Value Proposition (TVP). Telling team stories is all about showcasing the authentic perspectives and delivering the inside scoop on what it’s like to work in a team, including the employee experience, the culture, the people and the projects. This Rally Ideabook will show you 12 ways to create compelling team stories that tell your Team Value Propositions. We’ll share insight from 3 leading employers along with examples of successful team stories that speak directly to candidates and give them a better understanding of how they might fit within a team. Featuring AstraZeneca, BAE Systems and CVS Health. Stories Incorporated is a sponsor of Rally. Their sponsorship fee helps us to create educational content and events on Recruitment Marketing.